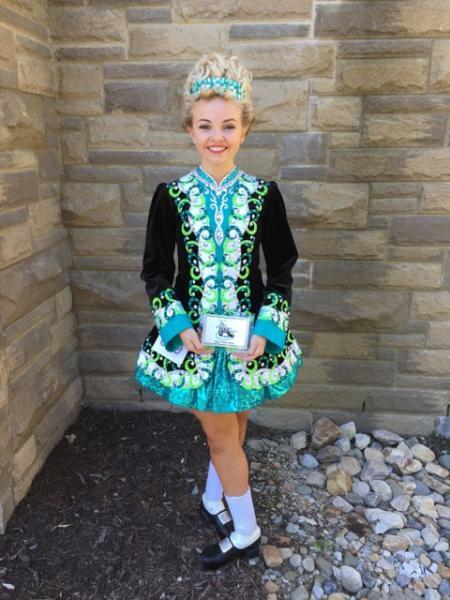 dance.net - Shamrock Stitchery dress for U16+ (10240899) - Read article: Ballet, Jazz, Modern, Hip Hop, Tap, Irish, Disco, Twirling, Cheer: Photos, Chat, Games, Jobs, Events! Locked by krisinstitches (207242) on 2016-07-27 10:20:58 SOLD!! 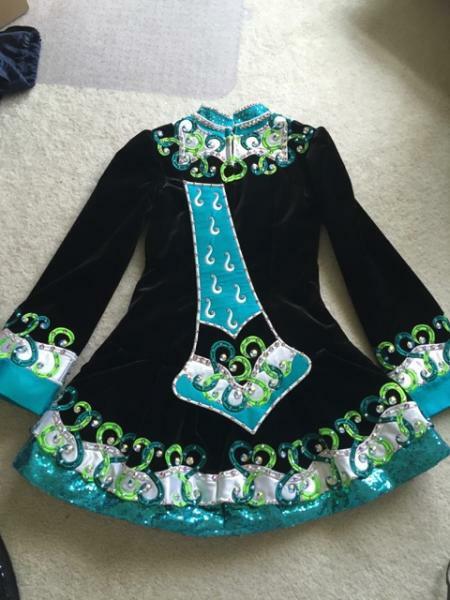 Gorgeous, classic-styled Shamrock Stitchery dress for sale. 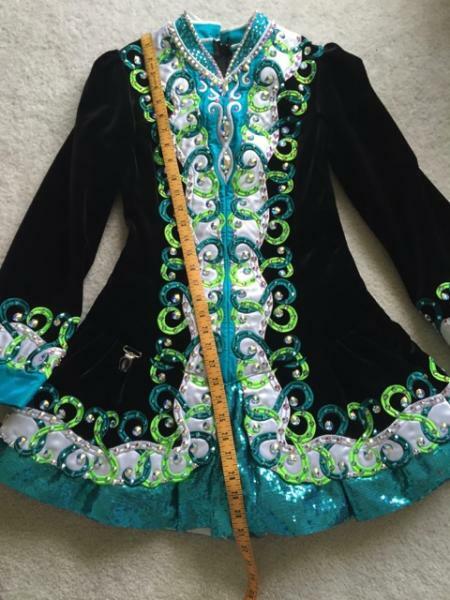 Made in October 2014, dress is fully blinged, is in excellent condition and meticulously maintained. No missing crystals, no embroidery pulls/snags. Some tanner marks at the neckline. 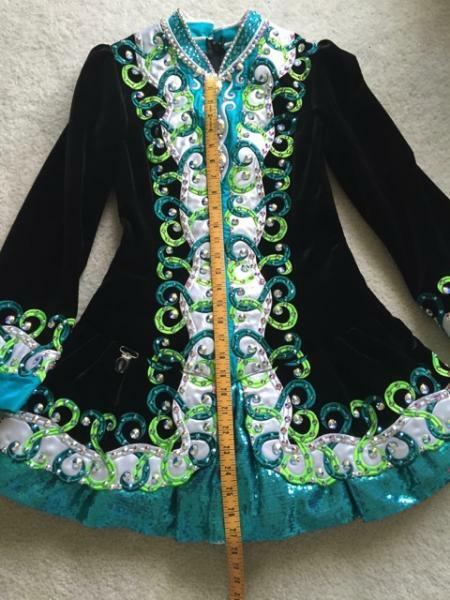 Dress is made of black velvet, teal silk and teal sequins. 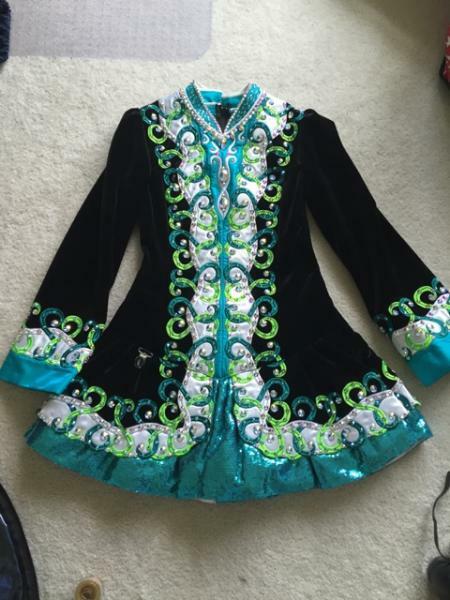 Embroidery is in white, dark teal, and neon green - a unique color combination! Underskirt is a bright orange satin. Dress comes with cape (attached at shoulder - does not detach) and orange bloomers. Can include teal crystal tiara if desired for an additional $30. Front length: V of neck to hem 27.5"
Front length: center of shoulder to hem: 31"
Back length: top of zipper to hem: 30.75"
There is about 2" of let out in the bodice (side seams), and about 1.5" of let down in the skirt. 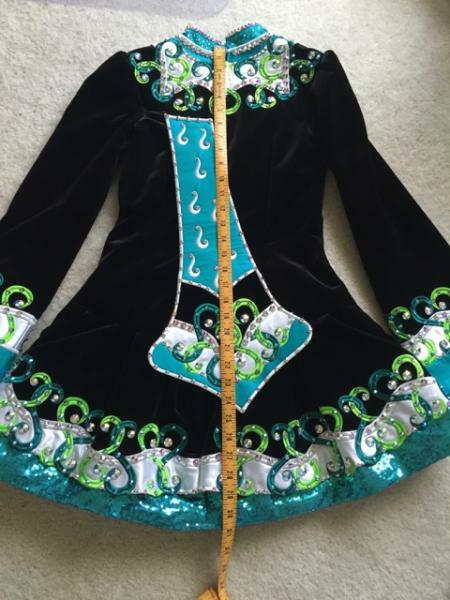 Other measurements/photos available upon request. Asking $1175USD or nearest offer. Shipping: included for US buyers, overseas extra. Returns: accepted for US buyers, dress must be returned within 3 days of receipt. Sale final for overseas buyers.